Camaraderie, laughter, friendship - that is the story of groomsmen! And of these groomsmen in particular. They took the pre-ceremony getting ready time as an opportunity to reminisce. I'm not sure what they are talking about at this moment but I love the animation in all of their hands. We love to capture natural and unscripted moments like this. 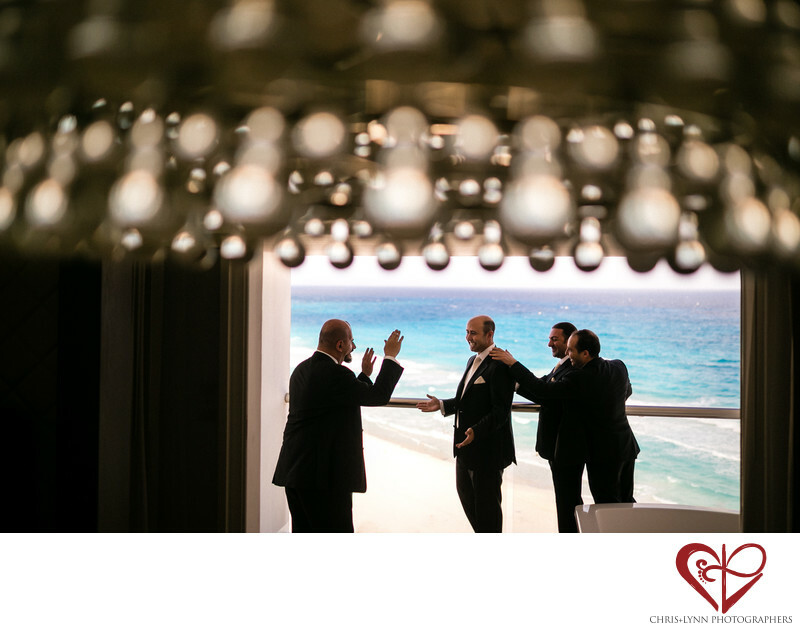 The framing of the men by the chandelier and the blue of the Caribbean add an extra pop to this groomsmen wedding photo in Cancun, Mexico. Since the day we first stuck our toes into the warm Mexican Caribbean waters almost 20 years ago, we always knew Cancun & the Mayan Riviera was our destiny as photographers. Now all these years later we love returning to our home near Cancun and photographing Riviera Maya weddings from Cancun to Isla Mujeres to Tulum to Bacalar. As wedding photographers, our favorite luxury wedding venues in Cancun and the Riviera Maya include Le Blanc Spa Resort, Nizuc Resort & Spa, Rosewood Mayakoba, Fairmont Mayakoba, Banyan Tree Mayakoba, Belmond Maroma Resort, Zoëtry Paraiso de la Bonita Riviera Maya, Viceroy Riviera Maya, Dreams Riviera Cancun Resort, The Ritz-Carlton Cancun, Grand Bahia Principe Tulum. Location: LE BLANC SPA RESORT, Km.10, Blvd. Kukulcan, Zona Hotelera, 77500 Cancún, Mexico. 1/2500; f/1.6; ISO 100; 35.0 mm.